After it was thoroughly defeated by the Oromo Liberation Army (OLA), the colonial army of the dictatorial regime of Ethiopia murdered members of the OLA by using poison in drinking water. This criminal and savage act is totally against a binding part of international law in the conduct of warfare. It is against the Geneva Protocol, a treaty that prohibits the use of poison in warfare. The colonial army has continued to operate all over Oromia with the aim of holding back the fast advancing Oromo people’s liberation struggle. 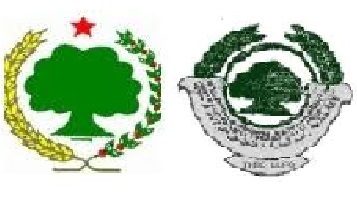 In the military engagement between the OLA and the Ethiopian colonial army on June 20-23, 2016 in south-eastern Oromia, the OLA completely defeated the Ethiopian army unit. The Ethiopian army unit, supported by “special force” was on search and destroy mission of the OLA in the Baalee region of Elkarree, Gooroo and Haroo Dibbee districts. The OLA totally foiled the mission when it killed 27 and wounded 18 of the enemy forces. In addition, the heroic OLA captured four enemy soldiers and large quantities of military hardware. Thus, the OLA annihilated the enemy forces and successfully foiled its mission to destroy the OLA. 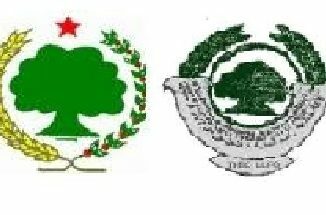 The ongoing and recently intensified Oromo people’s peaceful struggle for liberation and the advancing activities of OLA has greatly worried the Ethiopia regime and it is on the verge of losing hope of survival. As a result, in its recent engagement with the OLA the regime’s rogue army took a disparate act that clearly violates and contradicts the international norm of warfare. After a recent encounter with the OLA and its total defeat, the enemy Army poisoned members of the OLA. In Qaachan district of Baalee zone, the enemy in a cowardly act poisoned the water well found in the locality of Gola Qararrii. As a result, five members of the OLA were martyred instantly after drinking water from the poisoned well. In a similar situation, in 1981 the colonial army agents poisoned and killed a platoon of the OLA in western Oromia. Thus, it has become the culture of the Ethiopian colonial army to use inhumane and illegal means to fight the OLA. Such acts are a crime under any manner of encounter of opposing forces and it is against the peace and security of mankind and it constitutes a war crime. 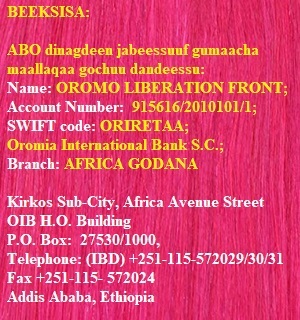 The cowardly atrocities committed against the OLA members is a sign of desperation and hopelessness of the Ethiopian regime that considers poisoning, continued intimidation, killing, imprisonment and exiling of Oromo revolutionaries, will not dampen the Oromo people’s determination and commitment to heroically struggle for freedom and dignity. 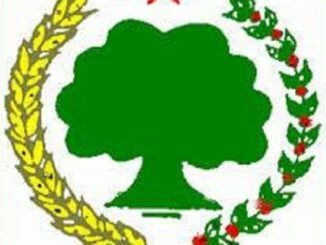 The OLF takes this latest action of the regime as an intensification of its war against the OLF and the Oromo people. The OLF will continue to defend itself and the liberation struggle and calls upon Oromo people to intensify its struggle of self-defense by any means necessary! 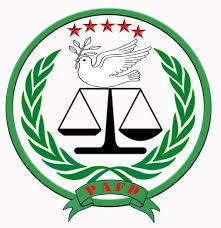 We also call on the international community to put pressure on the rogue regime in Ethiopia to respect the international norm of warfare and not to resort to barbarity, commit war crimes and to stop the military and financial support to the criminal regime.